How will I make money from my app? It's a question we're asked from time-to-time at Incipia and one which can be quite intimidating to think about, considering how many different types of apps there are, how fast the world of high tech changes and because the term coined for making money from an app (monetization) sounds like a word that would be located comfortably in one of Janet Yellen's quips on economic stability given the dichotomy between encouraging corporate capital investment via quantitative easing and the risk of future pricing inflation pressures. While paid downloads used to be the best way to monetize an app, these days most people are not willing to pay in order to download an app, which has led to very few apps choosing paid download as their monetization method of choice (according to Statista, less than 6% of apps are paid download). That said, paying for an app is still a viable method of making money for apps that provide a unique, differentiated benefit such as games or photo & video apps. Paid apps do have their own top charts that Apple defaults to displaying when selecting a category to view the top apps for, yet are subject (along with in-app purchases) to Apple and Googles' 30% cut of revenues. According to Android Authority, 49% of Android apps contain ads, with banner ads and interstitials clocking in as the most popular ad unit. However, the percentage of revenue generated from ads is much lower than that from in-app purchases, according to a collection of statistics collated by app engagement vendor, AppBoy. Display banner ad – the most common and oldest ad type, banner ads display in a persistent state for at least a few seconds in some area of your app's UI. While banner ads generate the least revenue and require massive volume to generate significant earnings, the notorious Flappy Bird put banner ads on the map by generating $50,000 per day from a simple banner ad located at the bottom of the screen. Display interstitial ad – the equivalent of a pop-up, usually appearing between user actions (e.g. loading a new game level). Interstitial ads make more money than banner ads, yet less than other types. Display video ad – Video ads generate the most revenue compared to text or image-based ad types given video ads are the most dynamic and intrusive, however, video ads typically see much lower volumes. Some apps such as Retry by Rovio even require users to watch videos after a break in actions before allowing the user to continue. 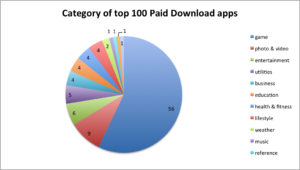 Most apps these days opt for a freemium or in-app purchase model, whereby users can download the app for free, but then must pay to unlock features or in-app content. The same AppBoy study per above also cites Appsflyer research that 5.2% of users make an in-app purchase, yet Statista forecasts in 2017 that in-app purchases will overtake paid downloads as the number one revenue-generating method for apps. 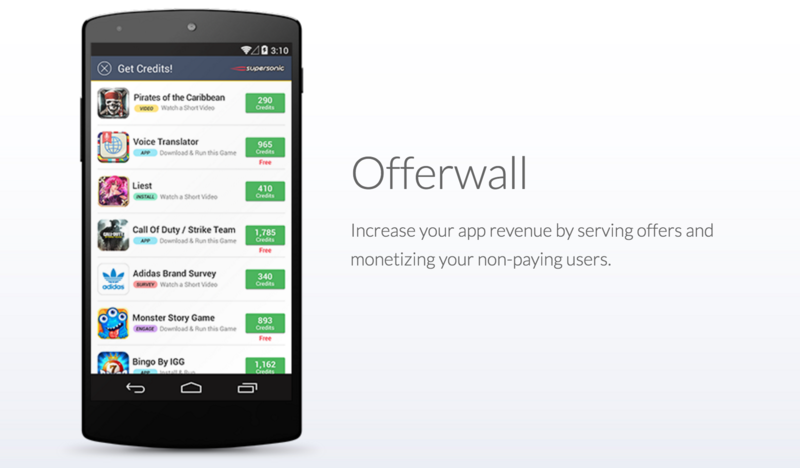 Onetime – in-app purchases which users pay once to own the in-app content or feature. 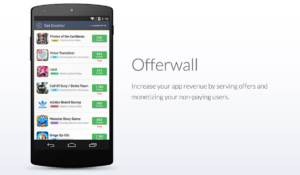 Subscription – in-app purchases which users subscribe to paying for on a monthly, weekly or yearly basis. Apple's new guidelines allow apps which keep users for 1 year will see their cut of subscription revenues from those users increase from 70% to 85%. Many apps such as WeatherBug include a "remove ads" in-app purchase or market a paid download app that is ad-free. While e-commerce apps must have a real-world good or service to sell to users, e-commerce purchases are not subject to Apple's 30% cut of revenues. TicketIQ, for example, allows users to purchase tickets to events from their mobile app in addition to their website. Localytics put together a study on e-commerce performance benchmarks, counting 37,000 apps which monetized with this method. Affiliates are apps which funnel new users to other apps like ads, but are only paid when their users perform a key action in the destination app, such as purchasing something. Typically, apps which have a lot of content monetize through advertising or become affiliates. Check out this update on Ibotta to learn more about the affiliate monetization model. While these are the main methods by which apps (currently) make money, the process of optimizing any given monetization model is not so simple and requires a lot of research, trial-and-error, analysis and tweaking. Additionally, these are the main methods by which apps make money, however, businesses can generate money through many additional ways, including sponsorship, donations, being acquired or raising private or public funding. That's all for now folks! Be sure to bookmark our blog, sign up to our email newsletter for new post updates and reach out if you're interested in working with us.